North Island Gazette Hamper Fund hasn't added a story. 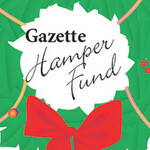 The North Island Gazette Hamper Fund has been helping those in need have a Merry Christmas for over 30 years. The Gazette Hamper Fund brings together communities across the North Island to volunteer or donate, to ensure that everyone has the opportunity to have a meal and gifts for their children under age 12 on Christmas. On average the Gazette Hamper Fund delivers over 600 hampers a year from Woss north and as far as Kingcome Inlet and Gilford Island. Hampers are available for families and singles in need. The hampers are delivered directly to applicants and come filled with food, goodies and gifts for children. We are proud of our communities who work together every year to help others and thankful that we can reach so many! We would not be able to do this without the support of the businesses, volunteers and kind hearted people who donate to this amazing cause. This year Black Press/North Island Gazette is introducing an online fund raising page to make it even easier to help donate and help your communities at Christmas. Please donate or share this page so we can help make everyone's season bright! North Island Gazette Hamper Fund hasn't posted any updates yet. North Island Gazette Hamper Fund is managing the funds for this campaign.